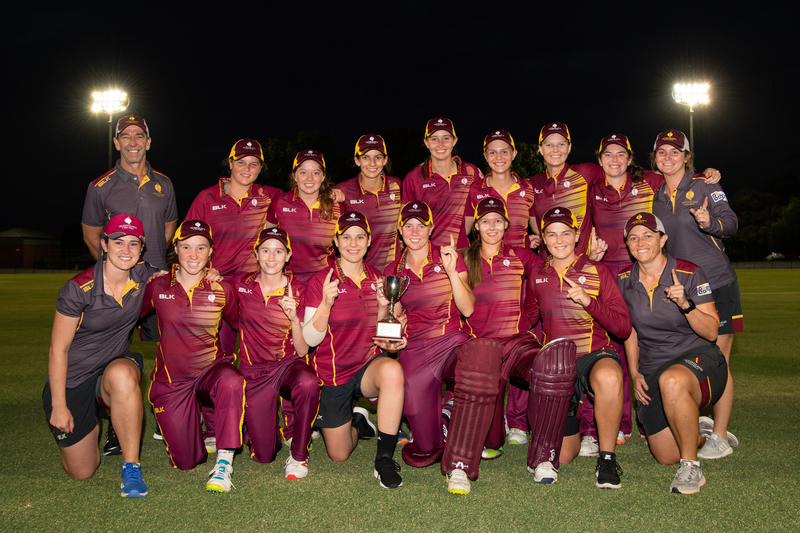 Queensland has claimed a comfortable seven-wicket win against ACT/NSW Country in its Twenty20 Final at the Cricket Australia Under 18 National Championships in Bendigo and Ballarat today. Having overcome Victoria Country in the semi-finals earlier in the day, Queensland won the toss and elected to field, putting on a dominant display with the ball to restrict ACT/NSW Country to 8/95. Anita Handono (21), Allison McGrath (18) and Sarah Young (13) all got starts for ACT/NSW Country but they lacked support, with scoring made difficult as wickets continued to fall. Lilly Mills was terrific with the ball, claiming 4-16 from her four overs, as Queensland piled on the pressure with the ball. In reply Queensland looked like it was cruising, reaching 32 before opener Ellie Johnston (9) fell cheaply followed just one run later by fellow opener Charli Knott (22). Mills couldn’t replicate her effort with the ball with the bat, but middle-order batters Courtney Sippel (31*) and Annie Wikman (19*) combined beautifully to add a further 50 runs to the total and see their side home in the 17th over. In the other playoff matches, NSW Metro proved too strong for Victoria Country in a low scoring affair. Having managed just 7/87 with the bat, Victoria Country couldn’t stop NSW Metro’s batters despite the best effort of Lucy Cripps who claimed three wickets. Olivia Porter was best with the bat in the chase for NSW Metro, compiling a measured 21 off 27 balls to ensure her side reached the target with 10 balls to spare. South Australia also won its match against Western Australia, with Emma de Broughe (33) and Laura Niejalk (2-18) the best performers with bat and ball respectively. Having posted 9/110, South Australia gave little away with the ball which made scoring tough for the Western Australia batters. Numerous batters reached double figures, but no one could go onto to produce the score needed for Western Australia, its innings coming to a close with the score 6/90 and well short of the South Australian total. The young Cricket Australia XI side won its match against the Northern Territory at Harry Trott Oval, chasing down the 76 runs required for victory in just the 14th over. Ella Hayward (22*) and Molly Healy (28*) did the bulk of the damage with the bat for the Cricket Australia XI, while teammate Ruth Johnston claimed the outstanding figures of 3-5. In the final match of the round, Tasmania defeated Victoria Metro by five wickets. Chloe Abel claimed three wickets to help restrict Victoria Metro to 7/89, before Amy Smith produced a game-high 35 with the bat to take her side past the total in the 17th over.